After self-publishing my first book, Come Back Strong, I knew I wanted to celebrate. There were a lot of details to figure out such as where did I want this event to happen? What day? What time? How to get the word out? What should I offer my guests? Coffee and tea? Beer and wine? How do I accommodate guests that love a good beer and others that prefer to cozy up with a hot beverage? There was one detail that I knew: I wanted to be fully present for my guests. I wanted to listen, laugh, and catch up for at least a few minutes with every single person that showed up. I was reminded of a Bible story of two sisters: Martha, the worker bee, and Mary, the social butterfly. They invited Jesus and His disciples into their home and Martha got pulled away by all the preparations in the kitchen. Meanwhile, Mary sat down with their guests, fully present, and able to enjoy their time together. Now, as much as I want to be like Mary, the social butterfly, I know I am more like Martha, the worker bee. How about you? Imagine hosting an event in your own home. If you are like me, a full-on Martha worker bee, you won’t relax. You stress over whether you have enough room for the number of guests you invited or the lack of fine dining. You drive yourself and your spouse crazy with the endless list of tasks of the utmost importance that has to be done before the party. You know, things like cleaning out the junk drawer, the medicine cabinet, and the gutters. Painting the garage, wallpapering the office, and landscaping the backyard. During the winter. You end up sweaty, bitchy, sleepy, and more than a little psycho! Isn’t that often the case? We start to think about all the preparations required and overwhelm sets in. We worry our home isn’t right or we are in the middle of projects that never seem to get finished. Maybe we don’t like to cook or maybe, just maybe, we worry that our floors aren’t clean enough. Then imagine, the day finally arrives. You are busy bustling around filling drinks and snack bowls while picking up empty plates and napkins to get a jump on the cleanup. You focus so much on the preparations that you miss out on the most important thing: showing up and being present at your own party. Let me tell you a little secret: your friends aren’t coming to spend time with your house. They don’t care if it is spotless or pristine. It won’t concern them if you are in the middle of a remodeling project. You don’t have to have a five-course meal or five kinds of cookies for dessert. Most times, your friends won’t even care if you feed them. Here is what I know: Your friends want YOU. All of you. Fully present. They want your time, your smile, your laughter. They want the twinkle in your eye and they want to celebrate with you whether it is the launching of a book, a marriage (or divorce), birth, graduation, holiday, or simply the fact that you opened your eyes today. 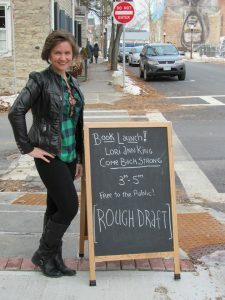 So, here is what actually happened: I had our locally owned bookstore, Rough Draft Bar & Books host my party. Yes, you read that right. It is a bar and a bookstore located in Kingston, NY that offers beer, hard cider, coffee and espresso, tea, as well as savory and sweet pies and pastries. This was the perfect solution. Let’s face it, we all have an eclectic group of friends with different tastes. Some like beer, some prefer tea, some just simply wanted to visit with me. Rough Draft allowed for all three. And, I got to be a little bit like Martha, the worker bee, and a lot like Mary, the social butterfly. In the weeks leading up to the event, I worked hard like Martha, preparing so that at the party, I could be present like Mary. I coordinated with the owners, Amanda and Anthony Stromoski over the day, time, snacks, and ordering of books. I got my invites out by snail mail, email, social media, and word of mouth. 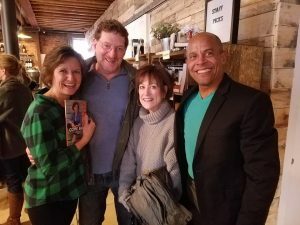 And then, on the day of my book launch and signing party, for over two hours, I got to be like Mary, the master at being present, fully engaged with my guests. The moral of the party? Prepare to be present. It’s the only time that matters. Wonderful point. Sometimes we are so concerned with being “perfect” to others we forget to just be the perfect person we already are. We tend to forget that we are already accepted in the Beloved.. I have your book, but haven’t yet begun to read it. Why? Because like so many others, I get caught up in the “doing” that I forget to just be. You are an inspiration, Lori, just by being you. May your blessings continue and overflow. Great advice, Lori. I will keep this in mind as I prepare for college graduation, Junior Prom, a bridal shower, and a wedding all in the next few months! I want to savor every moment and not get caught up in the prep on the days of the events. Wow! That’s a whole lot of things to celebrate Maureen! ENJOY!